If anyone has noticed, I haven't been around a lot this summer. I know, I know.. Mia fail, thank goodness I have the awesomeness that is my bestie Lisa to pick up my slack! It has been a hectic summer. After of years of hassle in the North East ( I am talking about you Delaware) I finally have all my U.S. residency stuff done in Florida!! YAY I AM LEGAL!! It is an exciting (and stressful) time I tell you. So instead of writing blogs I have been interviewing with immigration, talking to social security and trying to finally find a job in the good ol' U.S. of A. Which equals STRESS!! and lack of inspiration to blog about ( I am just not this witty on queue people!). That being said I am finding that I may be turning into a wee bit of an functioning alcoholic..ok I am kidding.. I don't drink that much, but some nights - a nice drink just eases those muscles. And then it hits me - OMG I CAN BLOG ABOUT DRINKING!! Welcome to Mixology Moment... I am your host Mia, let's get started. My drink this summer has been one I stole off of a friends facebook page (thanks Kira!). 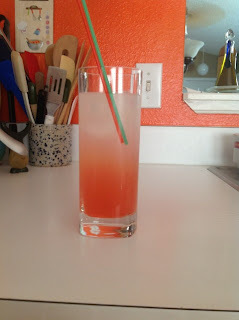 It is a Cherry Limeade cocktail! 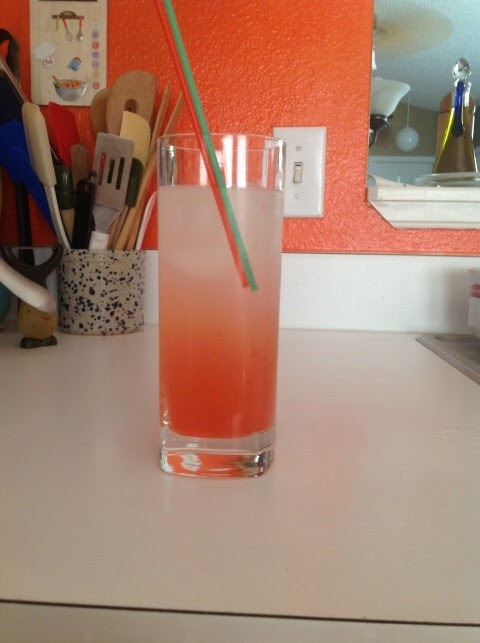 It is sweet, sour, refreshing and super simple. 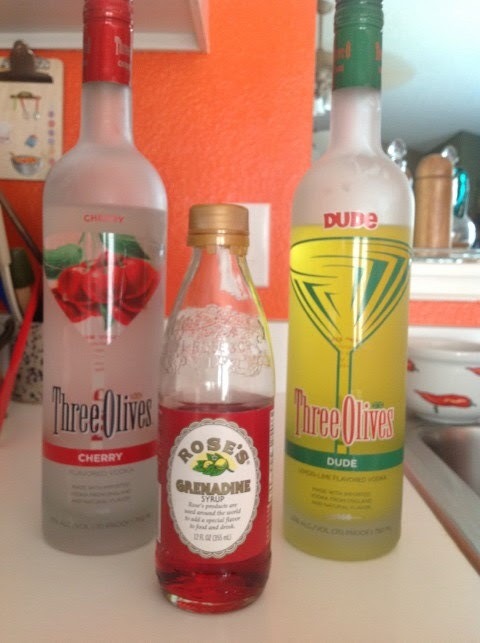 I have been using Three Olives vodka - 2 reasons - 1. That is what her recipe said (even though I am sure others would work just fine) 2. Because it was on sale at Albertson's liquidation sale, and I bought a bunch (lol). Add vodka and lemonade to a shaker with ice - if you are not embracing your inner James Bond, you can just add to a glass and stir. Shake (or stir) and add to desired glass. Drizzle with grenadine (approx 1.5 tsp). Since getting this recipe I have been researching other, similar recipes. I am hoping to try a couple I have found and test them against each other... may the battle of the cherry limeades begin!